If you listen to a song on the Internet and no one else knows about it, does it make a sound? Pandora is making it easier to validate your music choices with Facebook integration. The online radio service has long allowed you to share Pandora stations with your Facebook friends, but on Wednesday the two companies expanded their partnership. Now you can turn on automatic sharing of your listening activity, and publish specific tracks or artists you like, which will show up in Facebook’s new Music section. 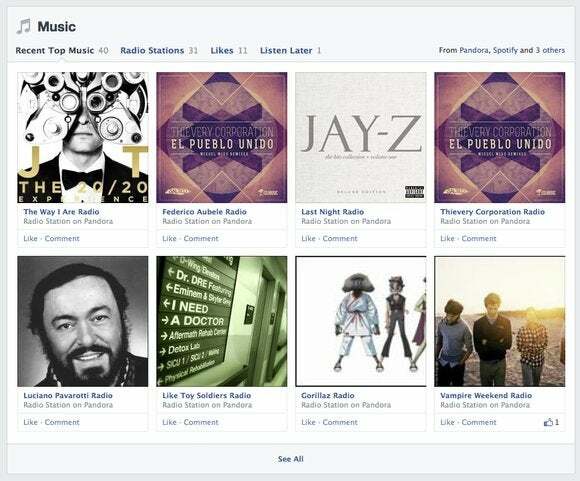 Your Facebook Music section will also feature radio stations you want your friends to jam out to. Pandora this week also started streaming select albums before they’re released, letting you play individual tracks in any order. Now you can share those yet-to-be-released tracks on Facebook and help your non-hipster friends listen to music before it becomes cool. Good work, you. But don’t worry, your listening activity won’t be searchable—at least not yet. Osofsky said your radio stations and artist follows won’t turn up in Graph Search, so typing “people in San Francisco who listen to Miley Cyrus on Pandora” won’t turn up any results. But the potential is there. Pandora CIO Tom Conrad in a Wednesday blog post reassured users that “you will always be able to edit your activity on Facebook in case there’s a guilty pleasure or two that you don’t want friends discovering.” Automatic sharing can also be turned on or off whenever you want. Facebook is not Pandora-exclusive. Part of Spotify’s success can be attributed to its users sharing Spotify playlists and current tracks to their News Feeds. iHeartRadio and Rdio are also integrated with the social network. Pandora is now ramping up its exposure to compete with the start-ups edging into its territory. Netflix also recently jumped on board with Facebook sharing. Now the whole world will know which movies and albums you deem worthy of watching and listening to, at last.